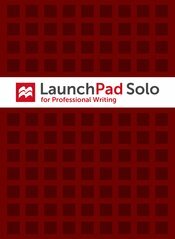 LaunchPad Solo for Professional Writing offers online tutorials on today’s most relevant digital writing topics, from content management to personal branding. Students develop the writing skills they need to succeed both in the classroom and in the workplace, and can explore today’s technologies in clickable, assignable learning sequences organized by popular professional writing topics. Walk through various report styles to see how medium affects message, or discover ways to use free online tools for presentations, collaboration, multimodal editing, and more. Get all our great resources and activities in one fully customizable space online; then use our tools with your own content. LaunchPad Solo for Professional Writing can be packaged at a significant discount with Writing that Works, The Business Writer’s Handbook, Handbook of Technical Writing, The Business Writer’s Companion, or Business Writing Scenarios.